If you applying for a job in the Indian Defense services, then along with clearing the written tests, you need to qualify certain medical and physical standards. In order to join the three branches of the prestigious Indian Armed Forces: The Indian Army, The Indian Navy and The Indian Air Force, you have to undergo the medical and physical examination held by various medical boards of the Indian Armed Forces. 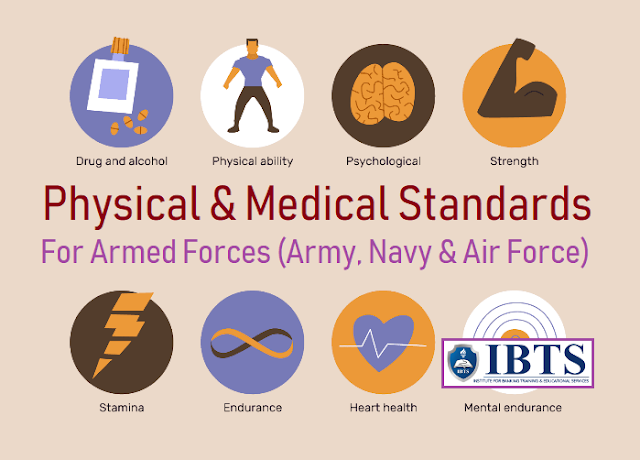 Here’s a list of the physical & medical standards for Armed Forces – Army, Navy and Air Force. Take a look at this list of Physical & Medical standards for Armed Forces before you apply for any of their exams. However, in case of candidates that fall under the category of Gorkhas, Nepalese, Assamese and Garhwalis (or belonging to the North East and other hilly areas), the height will be relaxed by 5 cm. However, in case of candidates belonging to the North East and hilly area like Gorkhas, Nepalese, Assamese and Garhwalis, the weight standards would differ depending on their height. All candidates are expected to have well-formed chests. For male candidates, the minimum range of expansion on inhalation, should be 5 cm. More than 0.5 cm will be recorded as 1 cm. Wax in the ears is not permitted. You should not have any skin disease i.e. Acne vulgaris, warts, fungal infection. No dental cavities including temporary filling and minimum 14 dental points. You should not have undergone hernia/abdominal operation in past one year. Any disease of bones and joints of the body would lead to immediate rejection. You should not have any past history of mental breakdown or fits. Normal hearing ability is required. Signs of functional or organic disease of the heart and blood vessel would lead to rejection. Normal blood pressure is required. However, candidates belonging to tribal communities/from tribal areas, as declared by the Government of India are permitted to have permanent body tattoos on any part of the body as per existing customs and traditions of the said tribe to which a candidate belongs. As per standards, you can appeal to the medical board for reconsideration if declared unfit after proper treatments for conditions like underweight, overweight, etc. within the stipulated period.